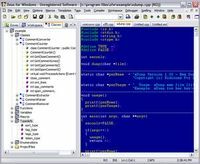 Text editor, HEX editor, HTML editor, PHP editor. 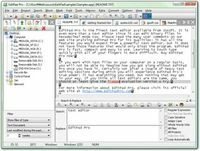 Suitable for general text editing, programmer's, web designers, binary editing, email, and all your editing needs. Key Features include: Disk based editing for files even greater than 4GB! 100, 000 word spell checker, with foreign language support - supports spell check as you type. Syntax Highlighting/Coloring for many languages including C/C++, HTML, VB, Java, Perl, ASP and more. Nested comments supported for syntax highlighting. 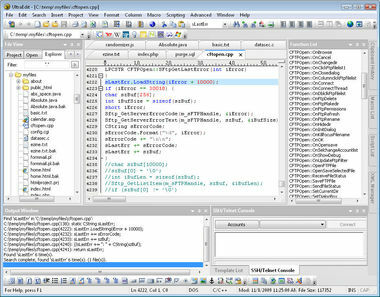 Code Folding, Brace Matching, CTags Support, CSE HTML Validator Integration, Integrated Scripting support, Integrated IE Browser support to show active HTML file, Configurable tool support allowing running of compliers, linkers etc. from within UltraEdit. Configurable toolbars and menus. Project/Workspace support. Optional automatic reload of last files open. Dockable function list shows functions in the file or project. SFTP and FTP client built in with support for muliple accounts and proxy servers. SSH/Telnet client built in with support for multiple accounts. Hexadecimal/binary editing including find/replace . Configurable Key mapping, Column/Block mode editing, Insert of string, or numbers for each column, Support for UNICODE, Multi-byte and UTF-8 UNIX/MAC/DOS file support and conversions. Favorite files/folders list, Text formatting, alignment and centering. Print/print preview including Syntax Highlighting. Find/Replace in Files, Auto-correction and auto-completion , Macro recording, playback and editing. 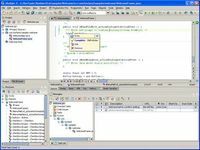 Macros include if/else statements and loops. Templates, ANSI/OEM conversions, Tab/Space conversions, Conversion to upper/lower case or capitalize, File sort, Word-wrap support, Multiple clipboard support, Auto-save and backup file support, Always-on-top option, Minimize to system tray option, ASCII file compare, Integrated HTML Tidy, Full screen mode, Bookmarks. As UltraEdit is disk based, it allows editing of files even over 4GB without using large amounts of RAM.